KUMANTONG FOR YOU: WHY INTRODUCE KUMANTONG TO THE WEST? WHY INTRODUCE KUMANTONG TO THE WEST? From the point of view of Christianity, magic is often used as a pejorative term for Pagan rituals, with the implication that they involve sinful, blasphemous or idolatrous practices. Among occultists, magic is a fairly neutral term which has some varied connotations, such as white magic and black magic. The famous occultist Aleister Crowley coined the spelling magick to distinguish "the true science of the Magi". Magic and sorcery practiced throughout the world share similar rituals, even though they are practiced in different part of the continents. It is believed to come from the same sources regardless of creed, languages and ethnic group. Before telling you why I am introducing Kumantongs to the West, let me tell you how I get started. I use to trust other people's 4D　Predictions more than my own. However, for every draw they will dump you a stack of 10 sets or more of 4D numbers to buy. It turn out none of the sets of 4D numbers has 90% chance of hitting. Even the Self-proclaimed 4D Masters were also doing the same thing. DUMP YOU A STACK of NUMBERS TO BUY. The turning point is when I decided to trust myself once and for all. The only best 4D prediction I can get is to find my own solution to it. I read up and do research of all kind of 4D Predictions and I manage to grab hold on a book written by a Singapore "Bomoh". His method was seeking 4D Numbers from Spirits and also other Dowsing Methods such as Pendulum dowsing, Lohan Fish, Automatic Writing and Remote Viewing. I was afraid to dabble with the unknown so I stop the idea of facing a ghost. I realized I kept a Kumantong Amulet and I decided to improvise a way to seek 4D Numbers with the help from the spiritual energy of Kumantong Amulet for the upcoming 4D draws. One hand holding on my Kumantong Amulet, another hand dangled with the Pendulum. On the very 1st try, Out of 4 Sets of 4D numbers, I won 3 sets. On the next try, I sought out 3 sets of 4D Numbers and again I won 2 sets. I was totally amazed. As time goes, I don't get to win 4D for every draws but I do win more often using these methods I improvised, which I taught you here. When I don't win, I'm still satisfied knowing that only 1 digit is missed in the TOP 3 Prize. I became more greedy after winning 4D from applying the Kumantong Amulet with Pendulum Method. I began to keep Kumantong Figurines and Oil Bottle Version. The 4D Prediction turn out to be as good as the Amulet ones, if not more Powerful. From the ongoing positive experiences I have on keeping Kumantongs and seeking Lottery Numbers from them, I start to ask myself why not share the knowledge and introduce Kumantongs to the Whole World. 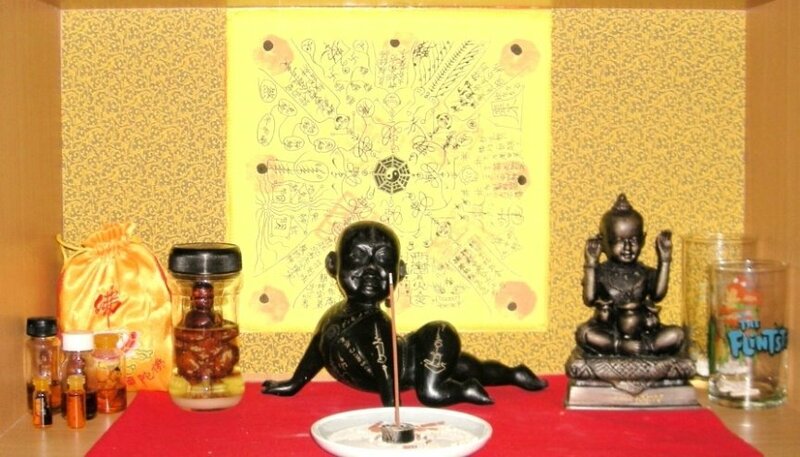 Kumantongs are widely worshipped in most part of South East Asia, it seems like a cult, therefore I intend to introduce them to the Western part of the World instead, since you folks in the West have no chance to dabble with the Occult of South East Asia, such as keeping Kumantongs. So here I'm, created this Blog or Website to bring Kumantong and Ruk Yom ( Lup Yong) into your life!